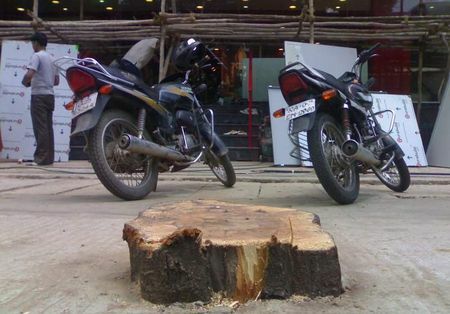 Three huge healthy trees were razed to pavement level overnight, right outside the Levi’s showroom at 80 Feet Road, Koramangala last week, triggering a whodunit controversy that refuses to rest. A war of words through email has been unleashed between the anguished residents of Koramangala and Levi’s management. While the residents are convinced that Levi’s staffers were involved in getting the trees chopped, Levi’s country head, in her email, outrightly rejected the accusation. “We have absolutely nothing to do with this act of felling – in fact, it had caught us by surprise one morning. We are an extremely responsible organization and would never even contemplate such acts,” said Shumone Chatterjee, Country head, Levi’s, in his first official statement addressed to the residents. Pointing out that Levi’s is a socially responsible organization, he added that “Levi’s is not one which would do such things just to benefit our store façade – we would rather have dropped the location. We have strong terms of engagement with our associates and vendors and there have been umpteen cases when we have lost business but have not compromised on our values”. However, residents remain unconvinced and are now demanding an internal inquiry to investigate into the incident. “It cannot be that three healthy trees were felled without intending to benefit the shop. It could be some individual’s whimsical act – someone who must be definitely associated with Levi’s – and Levi’s as an organization cannot absolve itself of any responsibility. We want them to initiate an inquiry,” responded Sarfy, a resident of Koramangala in his reply to Chatterjee’s mail. His neighbour Hiroo too was skeptical about the position of Levi’s. “If the organization really believed in protecting greenery, why didn’t they protect the trees? Why didn’t they stop this from happening? What if someone throws garbage in front of their store? Will they still take it lying down, and wash their hands off the whole issue?”, Hiroo questioned. Another Koramangala resident and civic activist, Major Kapur, sarcastically suggested that Levi’s should perhaps transplant healthy trees and name them after the Levi’s brand. However, Chatterjee is not amused by their comments and has termed their opinions as ‘circumstantial logic’. “Does it mean that none of the people who are criticizing Levi’s own a single piece of wooden furniture? Assuming that like most households, they do own such furniture, would that make them responsible for felling trees to contribute to their living comforts?” he wondered, in his second mail to the residents. In a conciliatory gesture, Chatterjee has suggested organizing a joint ‘Make Bangalore Green’ initiative to promote environmental awareness. “Just imagine – 2000 people across Bangalore planting 20000 saplings on one day! We would love to participate because we are keenly looking at making our products completely environment friendly – using organic cotton, organically processed dyestuff,” he added. Even as the blame game continues, the real culprits are still at large. Will they ever be identified? The answer remains elusive. Someone at Levis may be responsible for this action. But what about the BBMP? It couldn’t have happened without their collusion. The officials who okayed this should be brought to task. Unless such officials are not put into jail and asked to compensate, the situation will never improve. By some calculations, a tree contributes approx Rs 35L worth or value to the environment during it’s lifetime. If Levis is responsible they and the officials should be asked to payup this amount ie approx Rs 105 L.